Description: Come out of the cold! We suggest some ways to create an inviting interior.... Accent colours are key to creating a warm ambience in a room. Typically these shades are dramatic - use them sparingly in upholstery, curtains and cushions for example. In a hallway, keep the walls light (creamy tones are ‘warmer’ than stark white) and add the stronger colours in features and accessories. Choose rich, earthy colours as accents to create a feeling of warmth - use these stronger shades with care to avoid a overly ‘heavy’ scheme. Choose tones such as terracotta and ochre inspired by the warm Mediterannean climate, or opt for dark chocolate or coffee shades for a feeling of contemporary comfort. 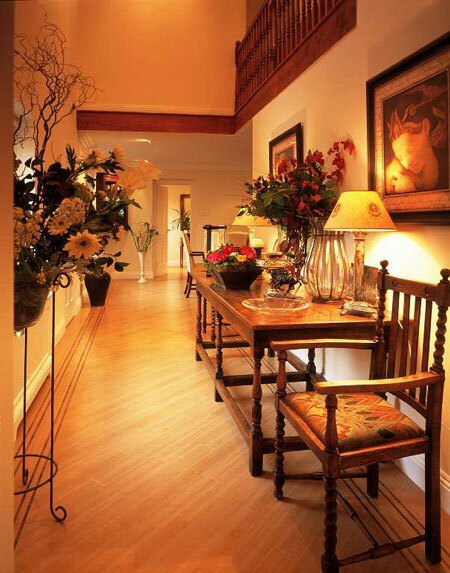 On the floor, there’s no denying that the look of wood helps to create a welcoming hallway. But many people are put off by the maintenance required with natural wood flooring. A wooden floor in a busy area like a hall will need to be sanded and waxed - many people find this type of floor time-consuming to maintain, and a little too noisy underfoot. As a hassle-free alternative, take a look at the range of over 30 wood effects from Amtico - so convincing are our products, we’ve known customers kneel on our floors and swear that it’s natural wood! With Amtico there’s no need for waxing or sanding, and our tiles are quieter underfoot too. To create a warm and welcoming hall, Antique Wood, Washed Teak, Teak and Elm are just a few of our favourite Amtico wood effects. Choose a ‘sawnwood’ texture for added authenticity and practicality. Or if you’re looking for something ‘different’, what about this design (left) inspired by Victorian encaustic tiles? And because it’s Amtico, the floor is warmer underfoot than ceramic too.